Absolute Carpet Care can restore water damaged carpets, homes, offices, units and bedrooms. If you leave water damage sit there for more than 24 hours, mould growth can occur and end up costing more money to repair. Our aim is to return your property to its original condition and get your carpets clean with as little inconvenience to you as possible, in as little time as possible. You need minimal interruption when repairing the flood damage…..
Top down drying method – This is where we do not have to remove, or detach the carpet from the floor to dry it. Works in most cases, usually when there is no carpet underlay i.e. the carpet is directly glued to the carpet. Also when the water damage has not been sitting there for too long. Installation of Dehumidifiers – To dry the water damage. We use air movers, but dehumidifiers can greatly speed up the water damage drying time. Turn the air conditioning on if possible. This will reduce the humidity in the air and help dry the water damage, do not turn it on if it is flooded. Use fans to help circulate the air, do not use when flooded. Put aluminium foil or plastic shopping bags under furniture to prevent non-reversible staining to the carpet. Do not lift carpet from the edges without the proper tooling, this can rip threads in the carpet and make it impossible to restore. Need us to invoice your insurance company direct? Name & contact details of your insurance Assessor. Any Excess on your policy must be paid prior to the restoration commencing. How long will carpet restoration take? Complete restoration of saturated carpet will “generally” take between 3-5 days. Our technician will advise you on the drying progress. 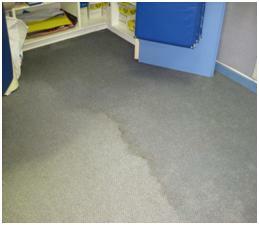 Carpet flooding such as this can be dried up in as little as two – three days. What Type Of Water Has Affected The Carpet? Clean Water (Category 1) – This is sanitary water and does not pose health risks. Grey Water (Category 2) – This is water that is not entirely clean and pose some risk such as dishwasher and washing machine water. Black Water (Category 3) – Grossly contaminated water which can contain pathogens. For example, sewage, toilet back-flow and seawater. In this case, we must replace the carpet. Call Absolute Carpet Care today on 1300 136 365 if you have water damaged carpets.